Back cover blurb: Bryony Gordon has OCD. It's the snake in her brain that has told her ever since she was a teenager that her world is about to come crashing down: that her family might die if she doesn't repeat a phrase 5 times, or that she might have murdered someone and forgotten about it. It's caused alopecia, bulimia, and drug dependency. And Bryony is sick of it. Keeping silent about her illness has given it a cachet it simply does not deserve, so here she shares her story with trademark wit and dazzling honesty. A hugely successful columnist for the Telegraph, a bestselling author, and a happily married mother of an adorable daughter, Bryony has managed to laugh and live well while simultaneously grappling with her illness. Now it's time for her to speak out. Writing with her characteristic warmth and dark humour, Bryony explores her relationship with her OCD and depression as only she can. Mad Girl is a shocking, funny, unpredictable, heart-wrenching, raw and jaw-droppingly truthful celebration of life with mental illness. When I heard Bryony Gordon had written another book, I was very happy indeed. Her first, 'the Wrong Knickers' had been one of my favourite reads of 2014. 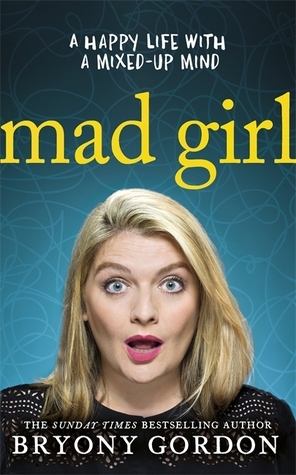 Bryony's second book, Mad Girl, is Bryony's account of living, day to day with mental illness. First diagnosed with OCD and clinical depression at the age of Seventeen, after suffering symptoms on and off since the age of Twelve, Bryony spends much of her teenage years trying to ignore the symptoms, until popping a note in her Mother's handbag to ask her to go to the doctors. Readers of 'the Wrong Knickers' will be familiar with some of what follows as we are taken through Bryony's life in her Twenties. The hedonistic lifestyle portrayed in Bryony's first novel is now seen from a very different side. Bryony's total honesty, now, helps us to understand why she chose to live her life that way at the time, because she felt in control and was able to hide from others what she was truly going through inside. Sadly even in the very modern world that we live in, talking about mental health issues is still a taboo subject, and there is absolutely no reason why it should be. We need more Bryony's to speak up and ultimately encourage others to talk about their experiences. If 'we' all stand up together, then we can start to see mental health taken seriously by the NHS, and people can get the help they need in a much more timely manner than they are able to now. 1 in 4 people experience mental health problems at some point during their lives, we need to ensure that we are all able to recieve care should we need it. We live in a country with a fully functional health service. If we have a broken leg, the NHS will fix it, so why is it so difficult for them to treat a broken brain...? Mad Girl, is a masterpiece. A very brave, very important book that everyone should read. Mad Girl is available to buy now from Amazon online and all good book shops.